Thanks to Jay Smethurst (@jaysmet) for guest posting this week — as we continue to explore new approaches for innovation in complex social ecosystems, I wanted to gain an expert’s perspective on some of the challenges; Jay has an extensive background in collaboration, and was gracious enough to lend some thoughts. CJ 9/14. The kinds of challenges we encounter in social ecosystems like Chris has described in prior posts require new approaches to developing solutions. I have been facilitating face-to-face collaboration for over a decade, and the design process we use to solve “wicked problems” (link) in the real world is applicable to these social ecosystem challenges as well. Our face-to-face processes, however, need to be deeply reconceived to leverage the strengths of various social media tools. The goal of this post is to propose a generic design process for solving complex challenges with a widely distributed participant population using social media. For now, let’s table discussion of the specific SM tools that are most beneficial for the different stages of the process, though tools will be central to a viable solution. Naturally, to solve a specific challenge in a specific domain, we will need to tailor the generic process and tools to the particular requirements of the project. This entire process begins when someone brings us a problem that requires some new thinking. These problems tend to fall into two categories. The first set of problems are those new problems that haven’t been solved before — new conditions or trends are creating new challenges that require an innovative solution. The second set of problems are those in which two or three camps have firmly entrenched positions about what the solution should be — in this case, the problem often needs to be reconcieved in order to discover new approaches that don’t align with the current us-versus-them models. 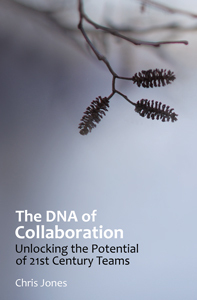 Our first challenge, then, is to formulate a very concrete objective for our virtual collaborative process. Generally, our objective is to develop 3-5 options or models of potential solutions, along with an evaluation of each approach. The number of options (3-5) is intended to represent more options than the one or two that are normally on the table already. This allows both “camps” (for the second set of problems) to participate fully, then joyfully thrash the “other side’s model”, yet fully engage in the development and evaluation of one or more new approaches. Because this process does not intend to identify “the best” model (although it often does), it diffuses some of the most volatile politics — we are rigorously evaluating the benefits and costs of several options, not driving any particular agenda. Every participant should find some ideas to like and some to dislike, and they are free (indeed, encouraged) to share those ideas. In such an environment, the extremist rhetoric of both “camps” in an issue tends to lose steam. The participants in this process will be divided into two groups – the Core Team and the Extended Participant Group. The Core Team should consist of 5-10 people with a good mix of expertise and skills. This group should include facilitation expertise, SM experience, and subject matter experts (“SME’s”) representing a variety of stakeholders in the social ecosystem that’s in focus. The Core Team drives and facilitates the entire process, and this group is responsible for delivering the final outputs of the process. The members of the Core Team must be willing to engage in a pretty rigorous design process — exploring different viewpoints and options openly before bringing their judgment to bear. Remember, if anyone had “the answer” already, we wouldn’t need this kind of process to begin with! The Extended Participant Group includes everyone else who contributes to the process. Ideally, this large, diverse group will engage in an extended design process along with the Core Team. It is possible, however, to engage various stakeholders in this process in limited, non-obtrusive ways. We can invite input and participation at various levels that will all add value to the process. Some stakeholders will want to contribute a lot of time, thought and energy. Others will want only to respond to a survey. Both levels of engagement are to be encouraged and accomodated. The Extended Participant Group will engage in specific tasks and assignments developed by the Core Team. Their input will then be synthesized and incorporated by the Core Team into the next round of activities. The generic process for Virtual Collaboration includes eight stages. The different responsibilities and activities of the Core Team and the Extended Group are outlined below. Process Design (“Calibrate”). The project begins with the recruitment of a Core Team. This team will then translate this generic process into a detailed program for this particular project. They will define the objectives and deliverables and map out the assignments and toolset for the project. The Core Team will begin to promote the project and recruit the Extended Participant Group. Orient. The purpose of the Orient phase is to set the context for the challenge that is being explored. The Core Team must also orient the Extended Group to the process and tools being used to explore the challenge. A number of methods may be used to Orient a group. An Entity Relationship Diagram asks participants to diagram the flows of information and resources between each stakeholder in a system. In an education system, for example, the stakeholder might include parents, teachers, students, administrators, school boards, communities, businesses, colleges/universities, etc. Explore. The next challenge is for participants to examine new perspectives and vantage points of the challenge-in-focus. Again, there are dozens of methods that can be used to help a group Explore new perspectives. Groups can look at different aspects of the challenge from different time scales (past, future, fast, slow), from different stakeholders (end users, suppliers, investors, producers, etc. ), or metaphorically from different systems (other organizations, industries or living systems). Build Options (“Prototype”). At this stage, participants must now struggle with solving the “real” challenge, but with certain constraints either imposed or removed. We want participants to “play” with the challenge and to see it in new ways. By imposing or removing constraints on their designs, we help them escape the mental trap of focusing on the barriers to change. Edward de Bono calls this the “intermediate impossible” — by playing with an “impossible” scenario, we might discover some new insight that allows us to design an innovative and workable solution in the real world. Synthesize. Each participant would then be invited to explore the models that others had developed and share insights, questions and feedback. By looking at the models created in Build and the feedback and insights, the Core Team would then identify 3-5 generic models or solutions to the challenge. The Core Team may also ask the Extended Group or a subset of that group to synthesize this short list of potential solutions. The 3-5 options would then be posted and described in general terms. Final Build (“Consolidate”). Now we develop the final solutions. The Core Team would then ask the Extended Group to flesh out each of the 3-5 models in detail. How would each model work? What would be the roles and responsibilities of each stakeholder in this model? How could the funding work? How do information and resources flow through the system? The Extended Group could work individually or in teams to develop a detailed model for one of the 3-5 options. (Participants may develop models for multiple options, but we need them to develop distinct and separate solutions for each option at this point.) These models will be posted in a shared space. Ideally, these models would include a visual model of the system, a narrative in text, possibly a quantitative model of how it would work, and a brief (1-2 minute) video of the participant explaining their model. The Core Team then has the enormous task of synthesizing all of the work of the Extended Group into the 3-5 Final Models. The Core Team will polish and publish these models publically and invite comment. Test (“Rate”; “Validate”). Next we invite public evaluation of the different options that have been developed. At some level, this is the most comfortable interaction for most public discourse — “what do you think of this option?” There are a variety of methods for collecting feedback on these options, and it’s a good idea to gather multiple modes of feedback. Edward de Bono developed the “PMI Tool” (Plus Minus Interesting) to move discussions beyond merely love-it/hate-it. We would ask each participant to list the Plusses of each of the 3-5 models, the Minusses, and the “Interesting features” — those elements or aspects that are novel, different, or just interesting for some reason. Publish. Finally, the Core Team would synthesize the feedback on the 3-5 models. As the final deliverable, the Core Team would then publish the suite of 3-5 solution models, along with the public evaluations of the PMI for each. I’ve just described a process that engages a very broad audience in the design and evaluation of novel solutions to complex challenges. This process can be made open to the public on issues of public policy or closed to a more restricted audience for, say, corporate strategy or innovation challenges. At some level, this is a pretty generic design process: Orient, Explore, Build, Test. It is in the application of the generic process to the specific challenge that the difficulties arise. And layering in a social media toolset as the interface for all of these design interactions adds a whole new set of complicating factors. But the output is something pretty spectacular – a variety of novel options developed and vetted by broad, engaged and informed public. How does this compare to the process for developing public policy today? This creates a much deeper and more nuanced public understanding of the issues and challenges, rather than the overly-simplified, us-versus-them battles of rhetoric that we often see around very complex social challenges. This process requires a deft and dedicated team to facilitate it, and an engaged participant group to contribute their best ideas and insights. It goes far beyond a chat on Twitter or a discussion thread or a blog post. But the combination of SM tools in service to a sophisticated design process has the potential to raise the level of discussion on hundreds of pressing issues in our sociaty. So, the question I put to Chris and to you. What will it take to make this work? And what challenge should we tackle first?